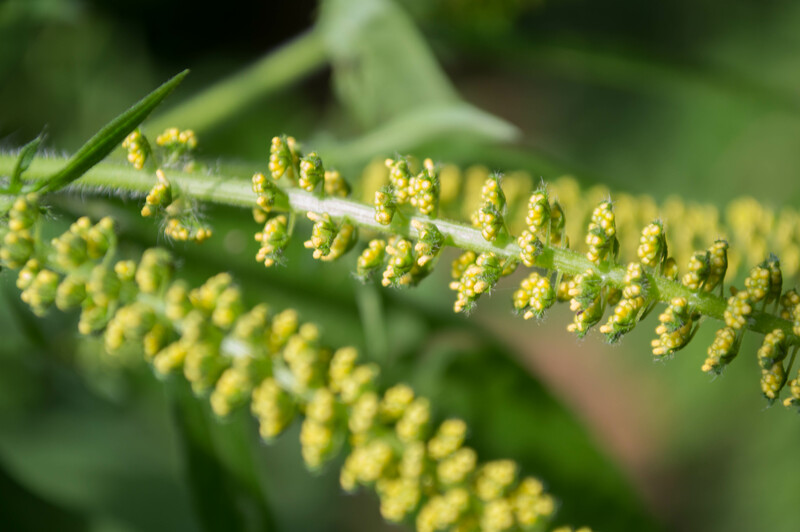 After posting about goldenrods over the last few days, I have to take this opportunity to dispel a common myth: goldenrod pollen is not an allergen. 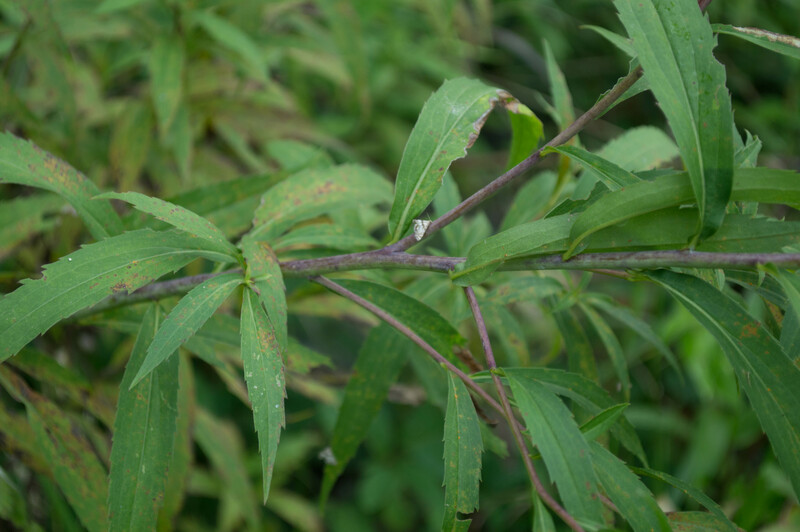 The culprit at this time of year is ragweed. 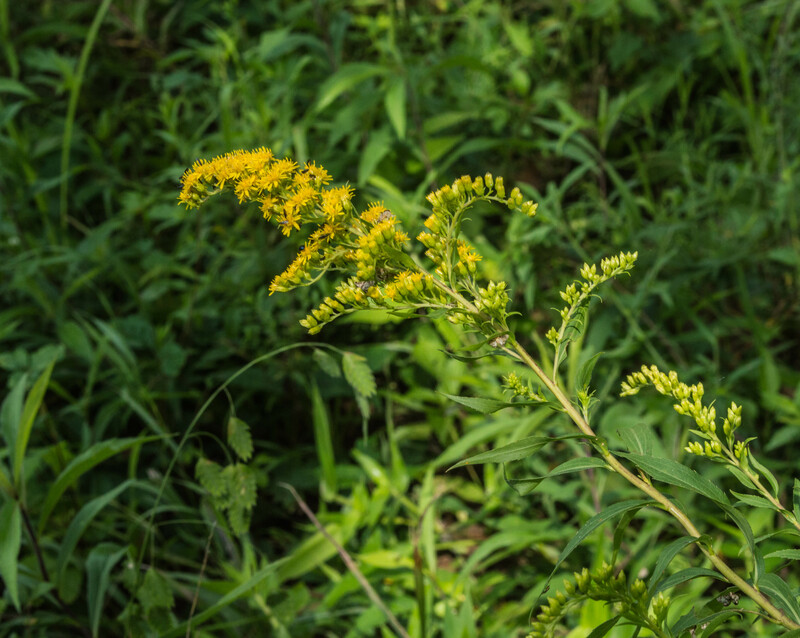 Goldenrod takes the blame because it’s so showy, but ragweed, with its tiny little unassuming flowers, is doing the damage. Actually the flowers are quite interesting. 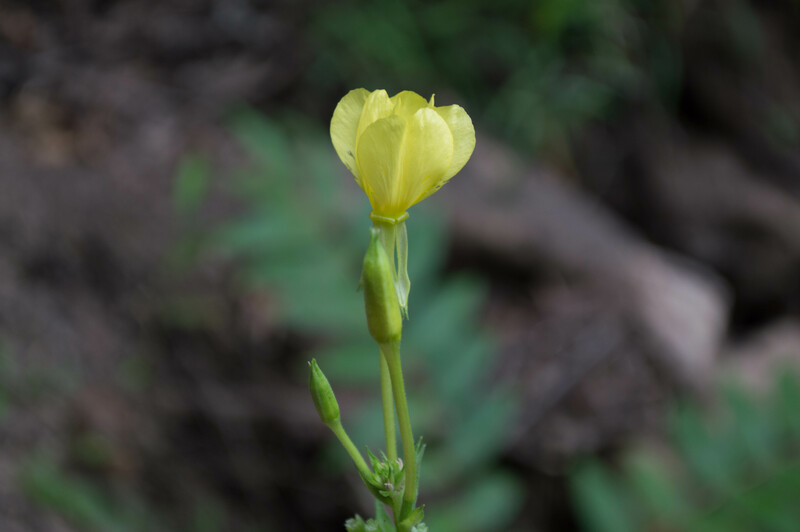 They are completely without petals or sepals. 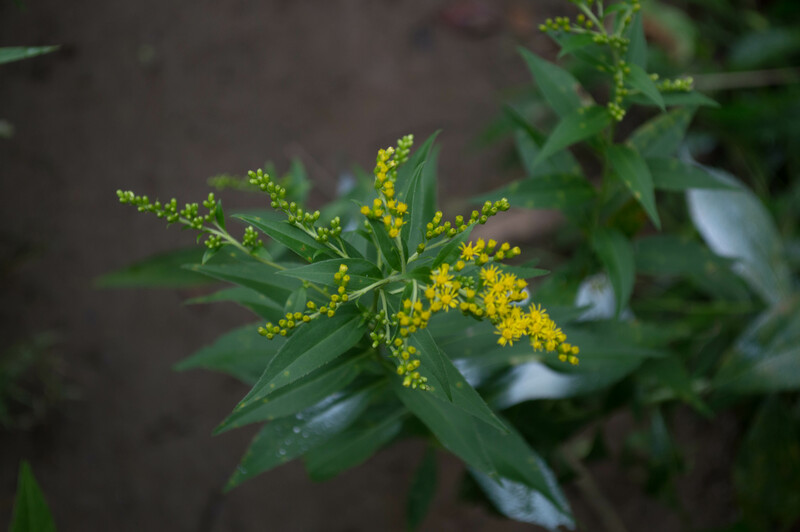 Each of the yellow dots in the picture above is an individual flower. 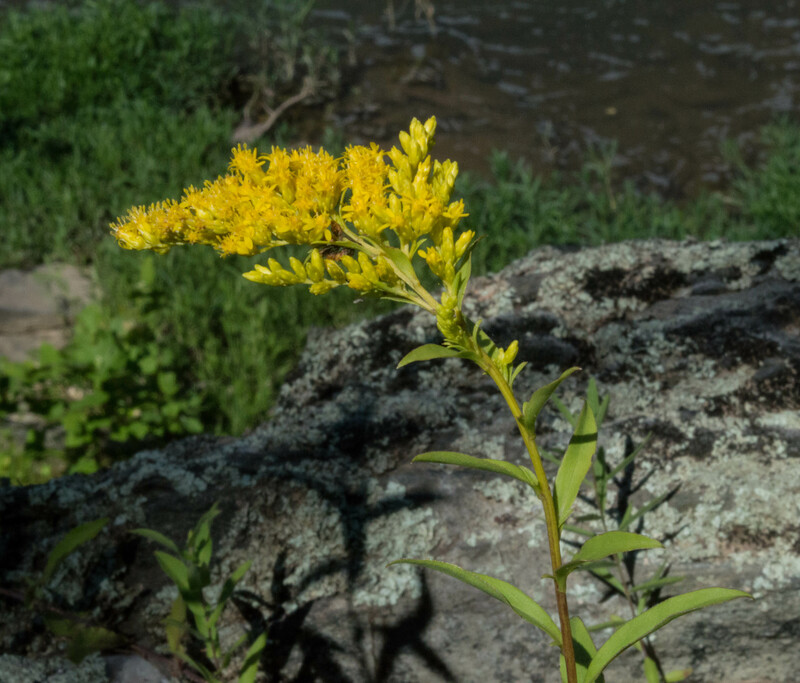 The other species are annual ragweed (A. artemisiifolia, with three subspecies, one alien and two native), and Cuman or perennial ragweed (A. psilostachya). The former is found everywhere; the latter everywhere except Delaware, Maryland, Virginia, West Virginia, and Kentucky. 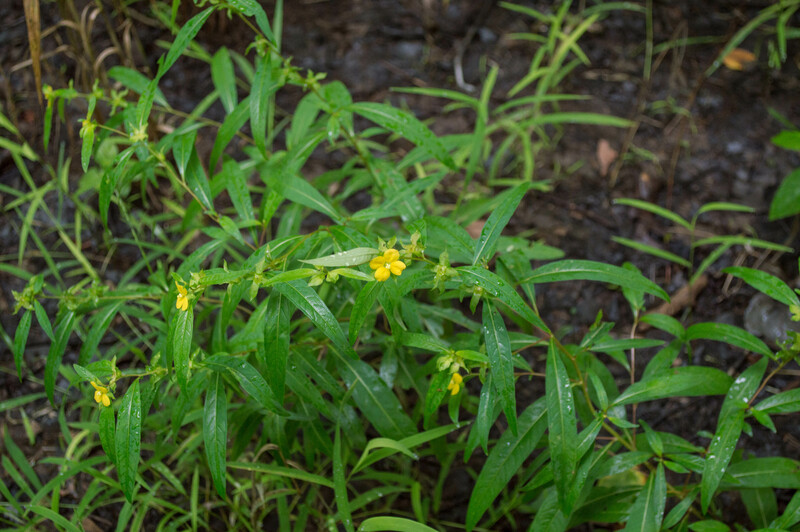 All of these ragweeds are listed as weedy and/or invasive by multiple authorities. 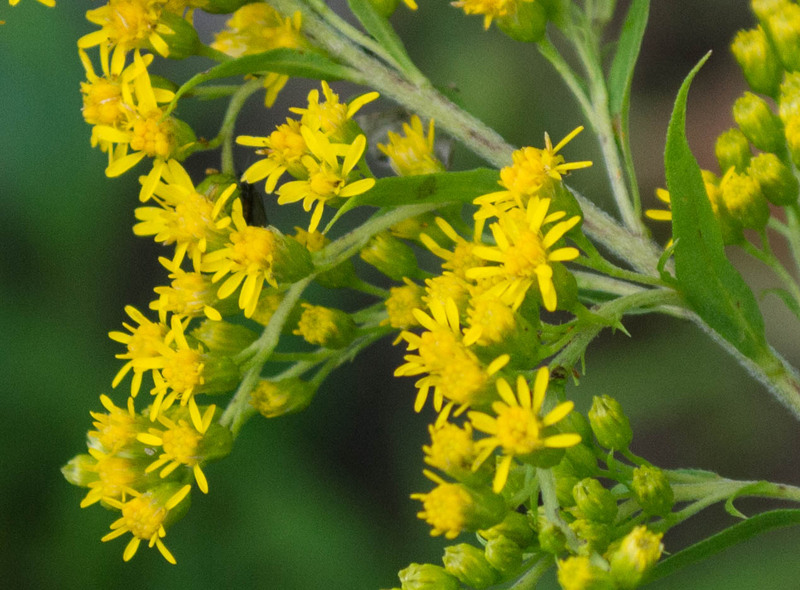 Remember: don’t blame the goldenrods for your misery. 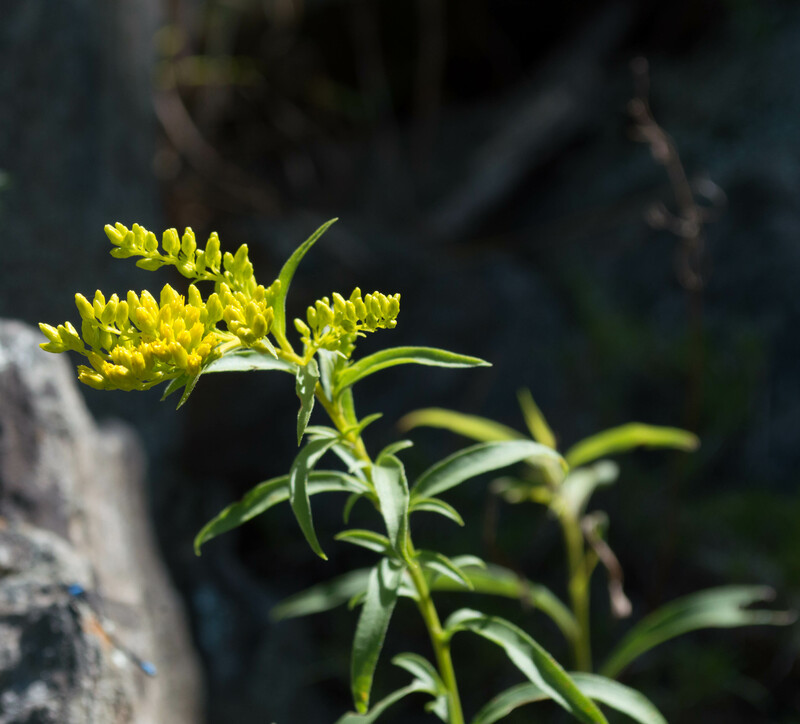 Look up goldenrod in any plant guide and you’ll be amazed at how many species there are – and how different some of them are from each other. Clemants and Gracie describe 22; Newcomb lists 30, in the back of his Wildflower Guide after “Parts Indistinguishable”; and Peterson has 29. 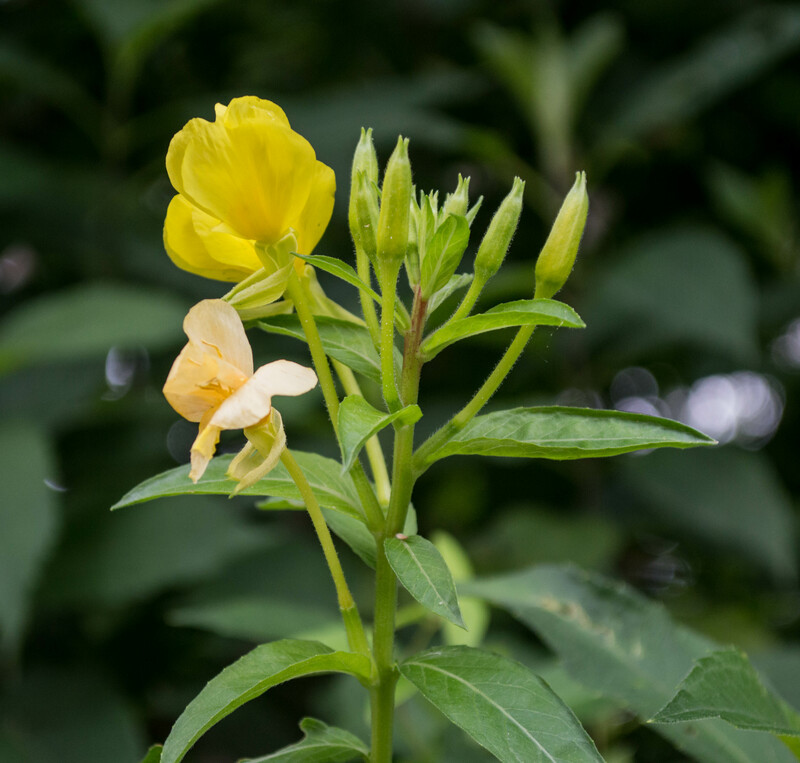 The USDA plants database shows 77, all native. Of these, as many as 32 might be found along the Potomac on the Maryland side (depends which authority you consult). So it’s with some trepidation that I start posting about them. After three years of doing this, I still consider myself a novice, prone to errors. 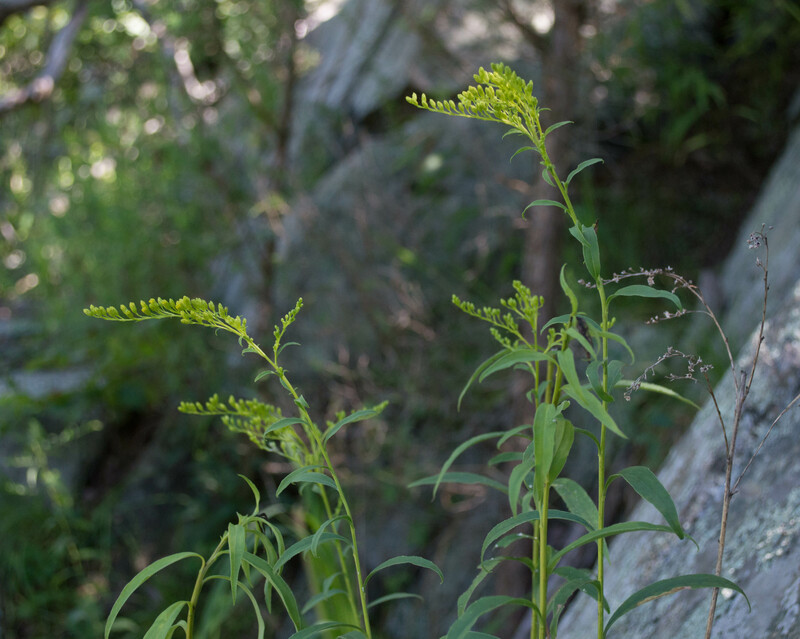 This species is the first one I saw this year, on July 14, on my favorite rock bluff upstream of Carderock. Here it is in bud, looking a little like a bird-of-paradise. And here it is a little further developed, buds not quite open. That particular area, by the way, has the highest diversity of plant life of any area I’ve found. It’s a rock outcrop that’s about 30 feet high by maybe 100 feet long. From base to top the soils and sun exposure are different. I’ve found several dozen different species there this year. 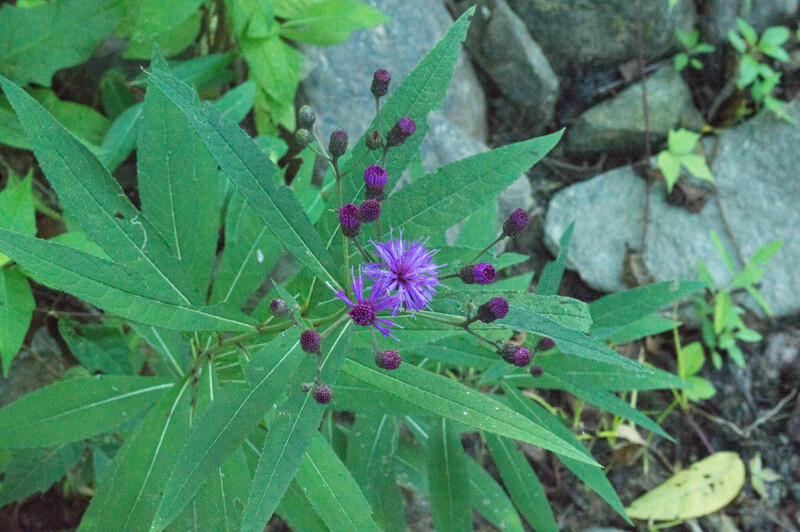 This coarse-textured plant is a joy to find in the wild. 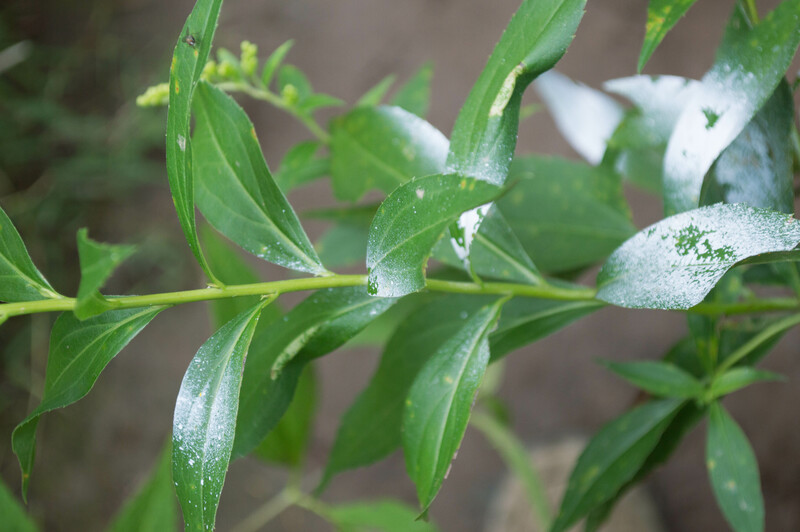 Growing up to six feet, it likes full sun and wet soils, so you’ll find it not far from the river banks, facing the water from the treeline. 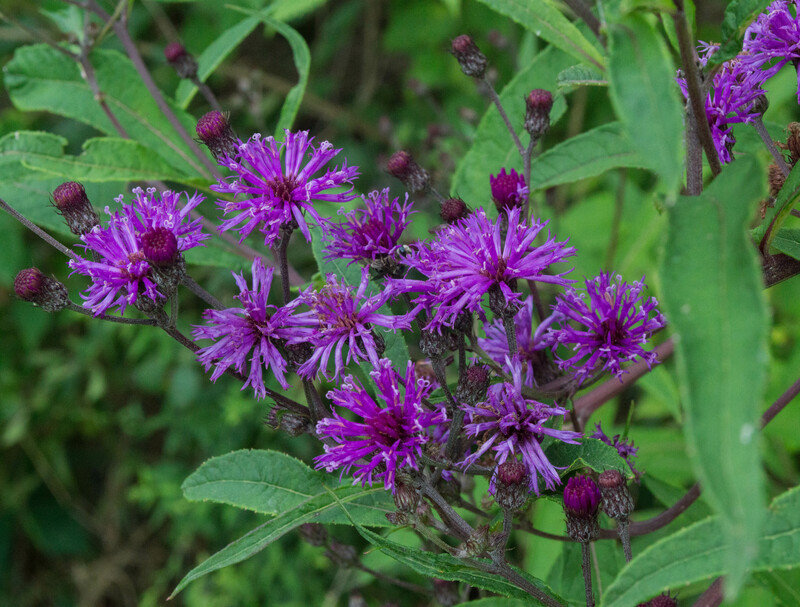 It’s one of 30 species of Vernonia native to the US, though only two others are found in this area. 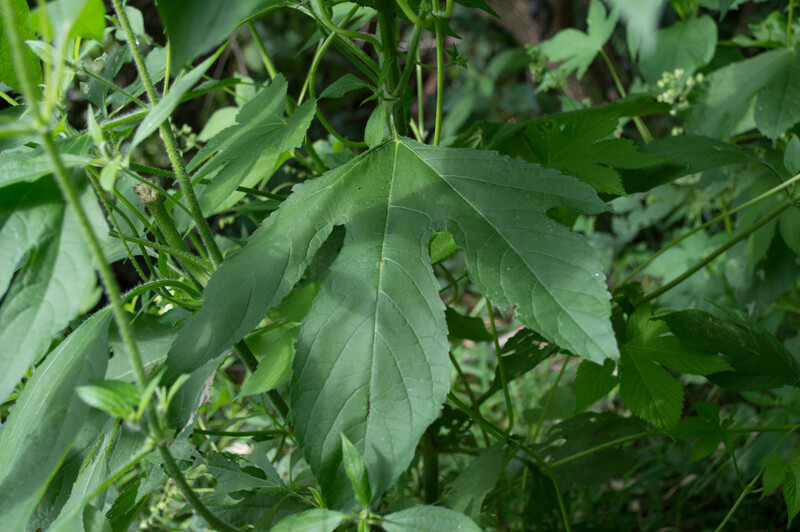 Occurring primarily on the East Coast, it’s listed as a plant of special concern in Kentucky, and is presumed extirpated in Ohio. 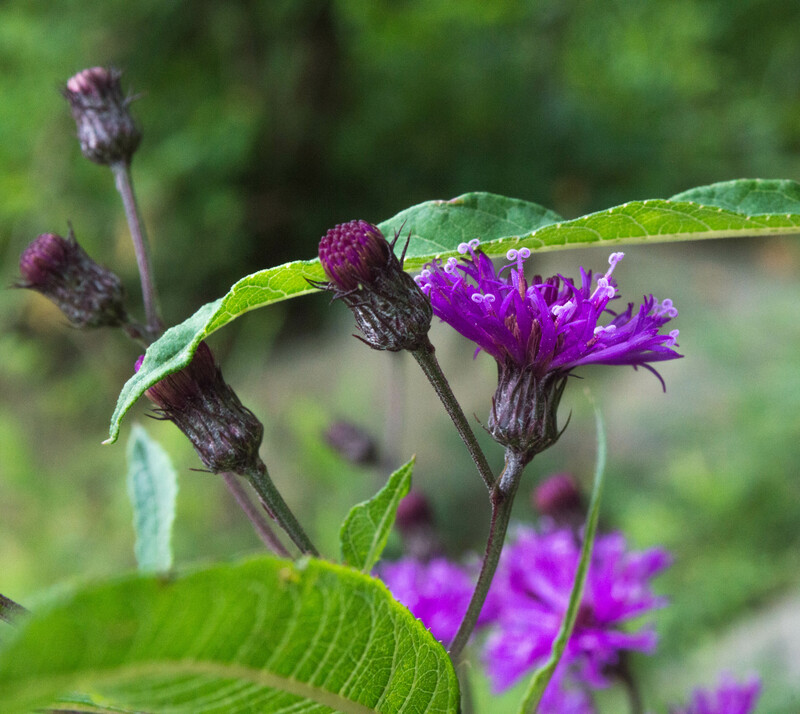 New York ironweed is also an important source of pollen. The Xerces Society considers it of “special value to native bees”. 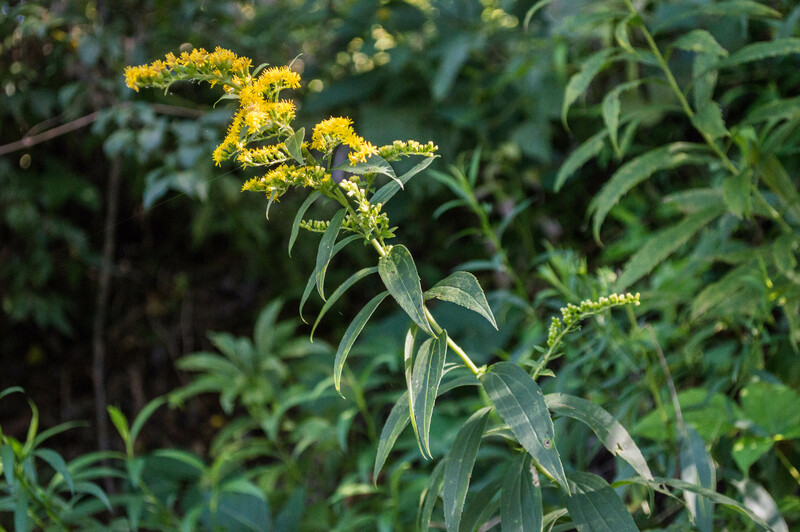 It would make a great companion to joe-pye weed in the back of a perennial border, especially in a yard with drainage issues. Remember hairy hawkweed from a few days ago? 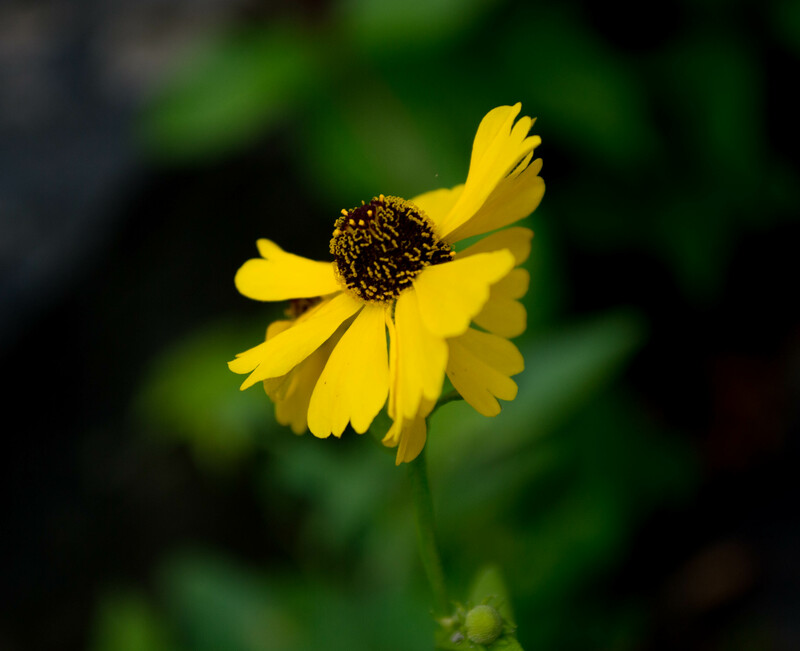 That composite flower has only rays. This one has only disc flowers. In the below left picture you can see the five petals of the corolla, with the reproductive parts rising out of them. l I love the intensity of color. 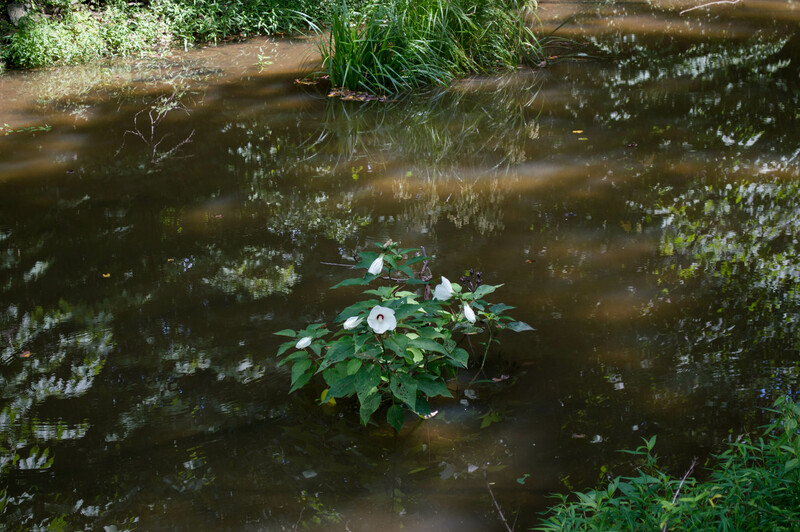 This cousin of halberd-leaf rose mallow (fotd 8/7) likes it really, really wet, as you can see. Last week I found a single clump; couldn’t get up close for photos without going for a wade. 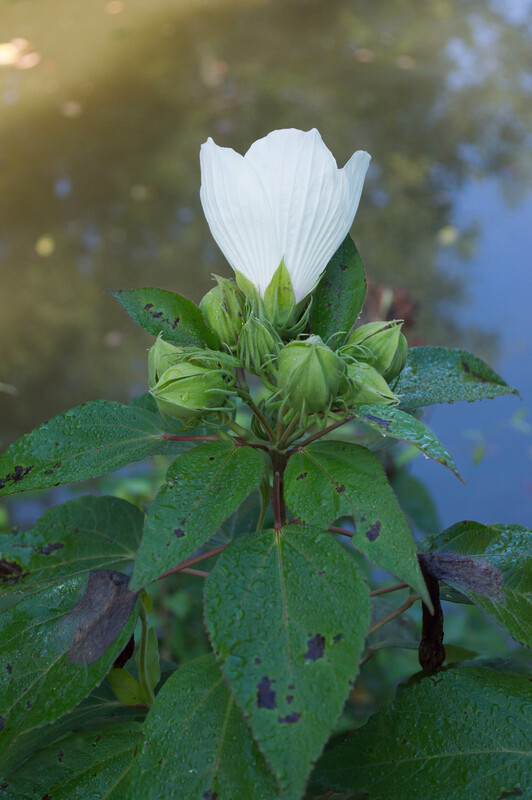 A few days later, though, I found one right on the canal edge, facing my direction, even, and in full sunlight, too! 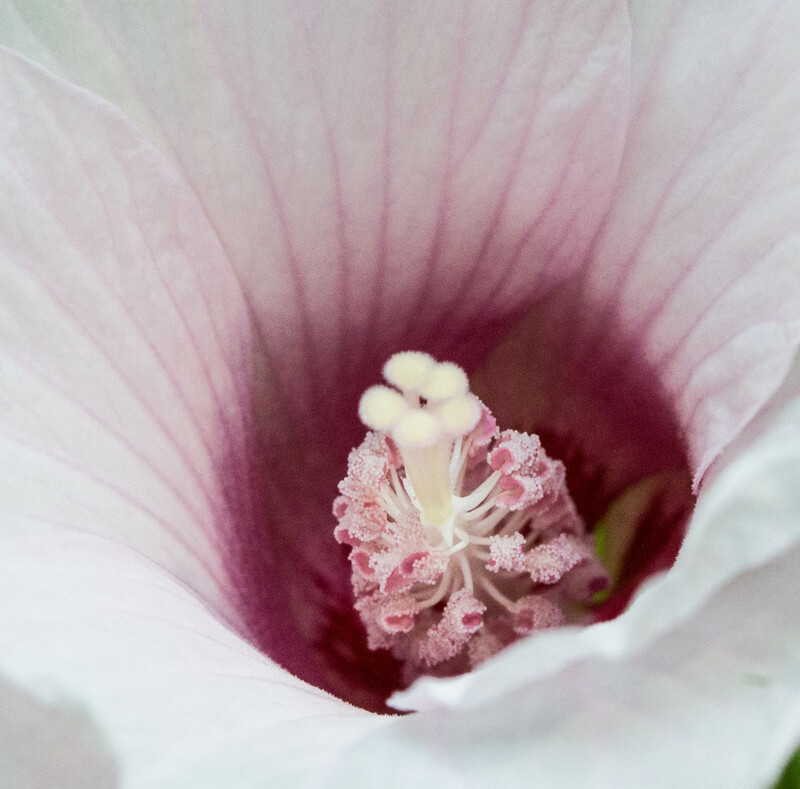 So out with the tripod and macro lens to have some fun getting up close and personal. Here’s enough detail for a basic anatomy lesson. 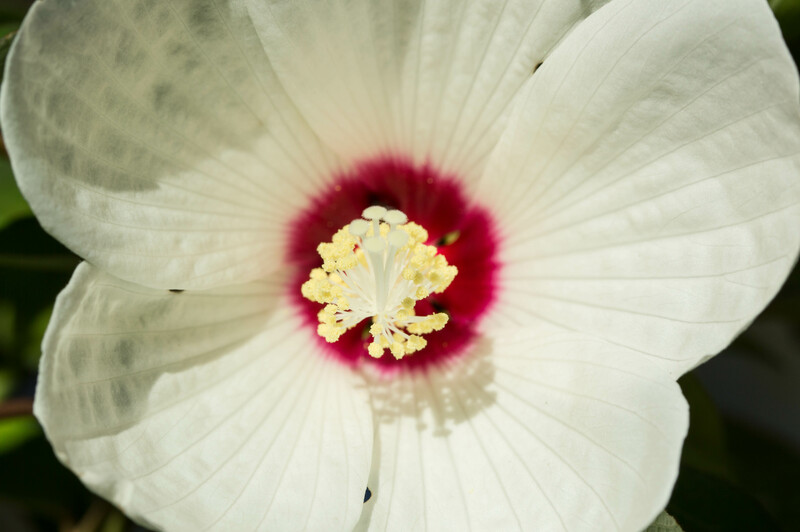 On the left side are the five tall pistils, typical of flowers in the mallow family. You can clearly see the stigmas perched atop the styles. Click on the picture to see the details – it’s incredible what a good lens can capture. 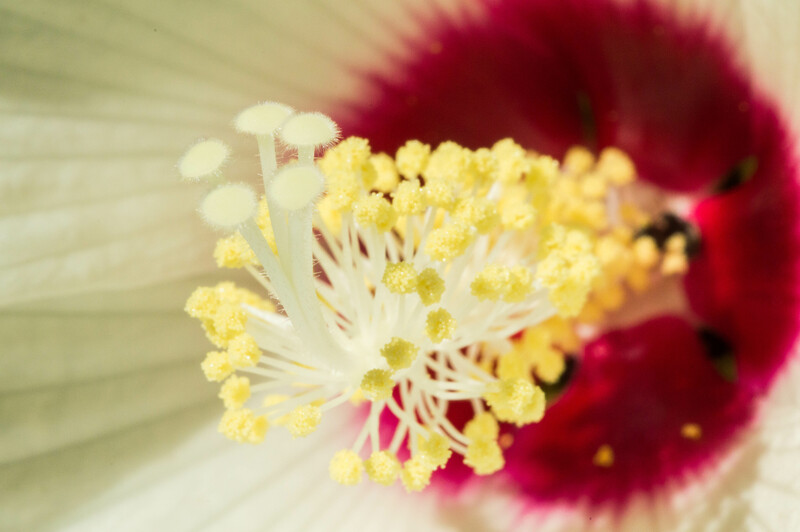 Surrounding the pistils are dozens of stamens, golden anthers topping the white filaments, which form a tube at least an inch long. 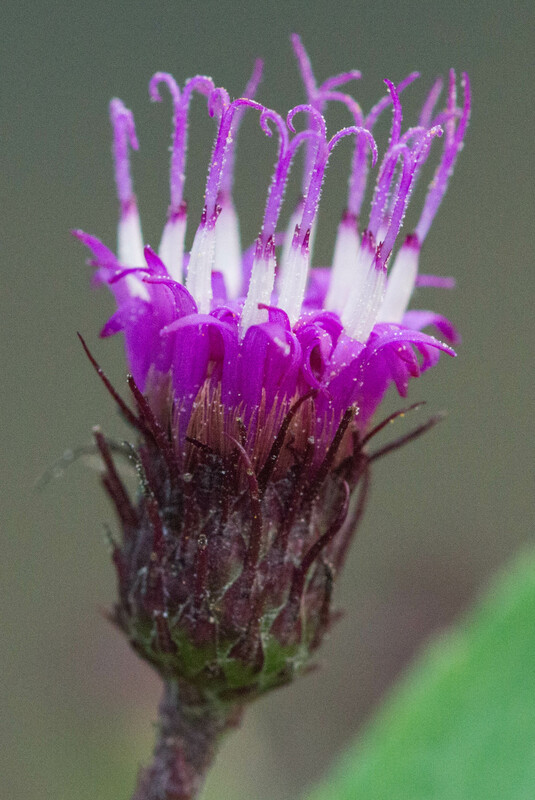 You can see the same basic floral structures in this species, though the anthers are pink rather than yellow. These two species are found throughout the eastern and southern US. 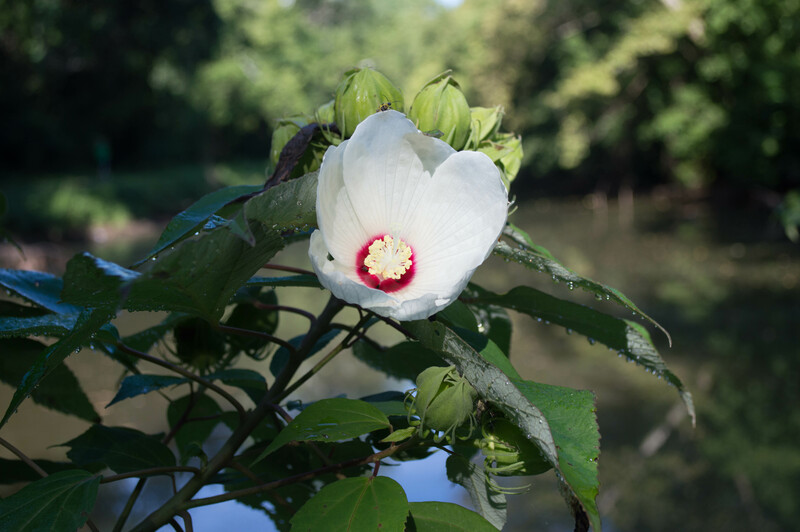 They are the only native Hibiscus found along the Potomac, though you’ll also find the common garden plant Rose of Sharon (H. syriacus) in the same area.